During the early modern period, visual imagery was put to ever new uses as many disciplines adopted visual criteria for testing truth claims, representing knowledge, or conveying information. Religious propagandists, political writers, satirists, cartographers, the scientific community, and others experimented with new uses of visual images. Artists, writers, preachers, musicians, and performers, among others, often employed visual images or conjured mental images to connect with their audiences. 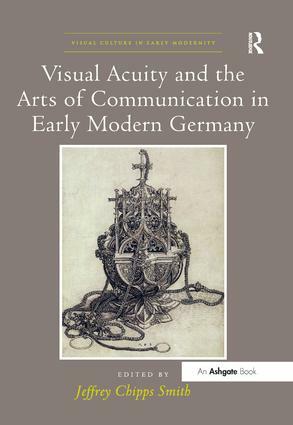 Contributors to this interdisciplinary collection creatively explore how the exponential growth in images, especially prints, impacted the intellectual horizons and the visual awareness of viewers in early modern Germany. Each of the chapters serves as a case study for one or more of the volume’s sub-themes: art, visual literacy, and strategies of presentation; audience and the art of persuasion; the art of envisioning; the ephemeral arts and theatricality; the built environment and spatial settings; and the history of the visual. Contents: Introduction, Jeffrey Chipps Smith; Intent and independence: late Fifteenth-century object engravings, Allison Stielau; Seeing Christ: visual piety in Saxony’s Erzgebirge, Bridget Heal; Johann Neudorffer’s Nachrichten (1547): calligraphy and historiography in early modern Nuremberg, Susanne Meurer; Apprehending the macrocosm: The Universe Cup of Jonas Silber and its sources, Andrew Morrall; Lucas Cranach the Younger’s funeral sermon as a Lutheran treatise on art, Ruth Slenczka; A musical dialogue in bronze: Gregor Aichinger’s Lacrumae (1604) and Hans Reichle’s crucifixion group for the Basilica of SS. Ulrich and Afra in Augsburg, Alexander J. Fisher; The acute gaze of Argos: Enargeia as sinful vision and psychagogic technique in Bidermann’s Cenodoxus, Anthony Mahler; ‘This charming invention created by the king’: Christian IV and his concealed music, Arne Spohr; Dynastic botany: banyans, cedars, and palms as visual models in Seventeenth-century genealogy, Volker Bauer; Royal and Roman in the rebuilding of Berlin c. 1700, Kristoffer Neville; Index. Jeffrey Chipps Smith is Kay Fortson Chair in European Art at the University of Texas at Austin, USA.